Plot Summary: Dr. Hell and his Mechanical Beasts are back, and they're more dangerous than ever before. Kouji Kabuto and Tetsuya Tsurugi fight a fierce battle against these hellish machines, which are under the command of Baron Ashura. Unfortunately, they are defeated, with Kouji's Mazinger Z being captured and Tetsuya's Great Mazinger seriously damaged by the enemy. The devious Dr. Hell quickly converts the captured robot into Ashura Mazinger and uses it to attack the Photo Power Lab. 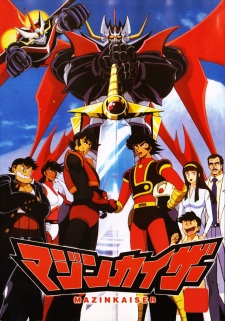 At the same time, Kouji is missing in action, which leaves Testuya to defend the lab in the damaged Great Mazinger. But the forces of Dr. Hell are too strong, even for a brave pilot such as Tetsuya, and all seems to be lost. The battle seems to be drawing to a close, until an overpowering blast fired by an unknown robot destroys the entire Mechanical Beast army. Could this mysterious robot be the legendary Mazinkaiser, and who is piloting it?